​For more than 23 years Boys & Girls Club of Washington County has been helping kids reach their full potential! 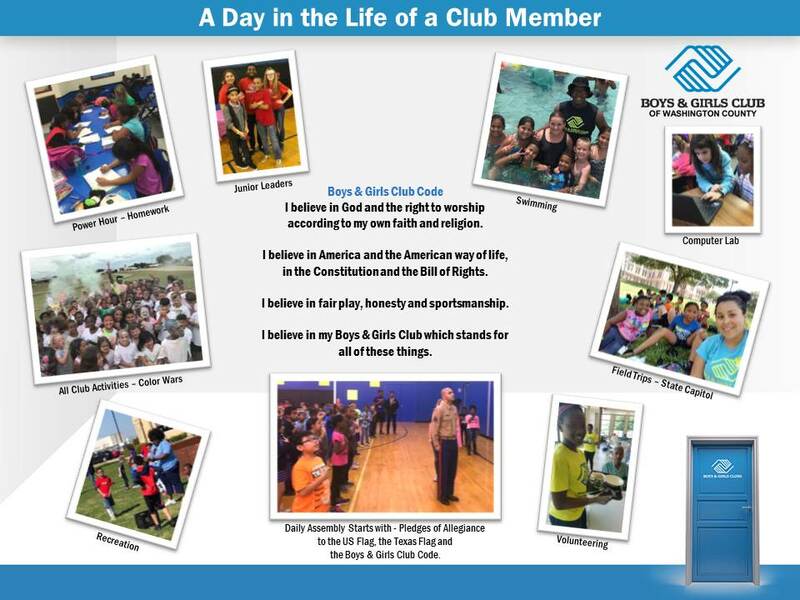 ​Enroll your child in the Boys & Girls Club of Washington County to give them access to positive role models, fun and educational activities, nourishing snacks, and opportunities to build character in a safe environment. Our diverse programs help kids and teens unlock potential by learning new skills and exploring new interests. ​Boys & Girls Club of Washington County accepts youth and teens ages 6 to 18 and currently in 1st -12th grade. We offer programs in two locations - our Brenham facility located at 1710 E Tom Green Street and on the Burton ISD campus in Burton. Our membership fee is $50 per child annually. Our 2019 Summer Program fee is $85 per child when you register April 1-30, 2019 or $100 for late registration which is May 1-17, 2019. To enroll your child, please fill out the Membership Application and drop it off at the Brenham location; we accept cash, check/money order, or credit card. Need-based scholarships are possibly available through Brenham GameChangers. Please click here to complete their application. ​Transportation from Brenham schools must be arranged through Durham School Services 979.277.0090. The Junior High and Middle School members typically walk to the club in a group due to the close proximity. If there is inclement weather, Durham School Services will provide pickup.